Local resident on the Palouse, Emily Poor, runs Poor Farm Publishing from her home. She has recovered from a traumatic brain injury from an accident she had 10 years ago. 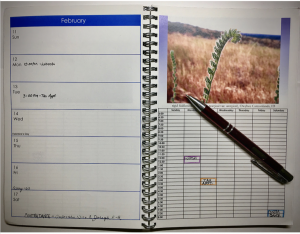 During her rehab, she started making her own day planners to chart out her week and keep track of her appointments, as well as journaling tidbits about each day. She is also a botanist and uses her photographs of plants from our region to enhance the planners. These are a great help to anyone who still prefers using a physical book to help plan and organize their life. These planners have been developed over years to come up with the perfect balance of features.Spiral binding allows it to lay flat so you can easily turn to the page you want. The weekly and daily planners are on opposite pages so you can see both at the same time when the book is open. You can view your busy schedule by the hour. PLUS a beautiful plant photo enriches you daily routine. These are correctly identified with both common and scientific plant name visible. Emily even identifies the insects in each photo when appropriate. There is a regular monthly calendar page and a notes page opposite it with each month color coded differently. She now has them available in several local stores including BookPeople and University of Idaho Bookstore.